The timelessness of shiplap blends with lake chic accents in perfect balance. Bright and spacious interior, stone front elevation, privacy and convenience and overlooking a golf course view without being in "play makes this home a remarkable value. Recessed from the road in an inviting paver courtyard setting, the stone exterior and minimal low maintenance hardi plank appeals to those who prefer to enjoy life at the lake over upkeep. Location is key in real estate and being able to walk to the amenities checks that box. A short golf cart ride up the street provides access to the cart path to take you to the clubhouse and amenities or out to the course. Anyone who enjoys an invigorating walk can get there almost as fast. 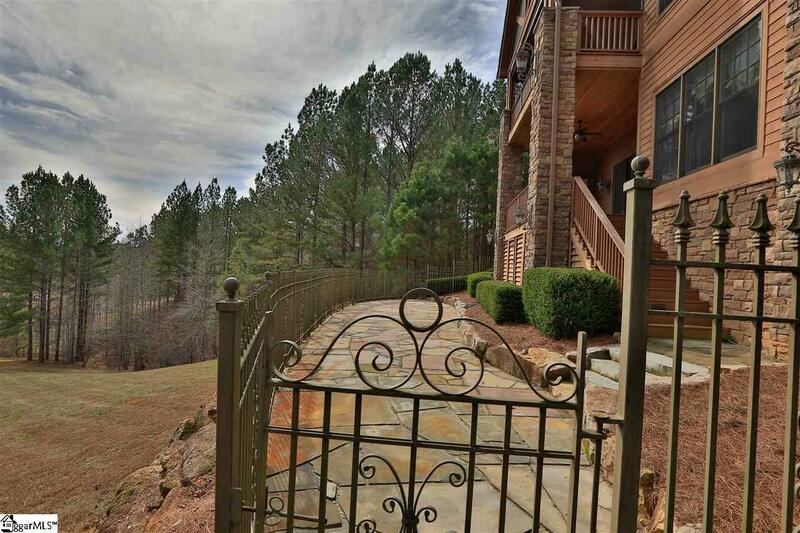 Set on over 2 acres, and encompassing 5000+SF, the home boasts 5 BR plus custom bunk room and full baths for all. The substantial wooden double door entry sets the stage for the quality within. 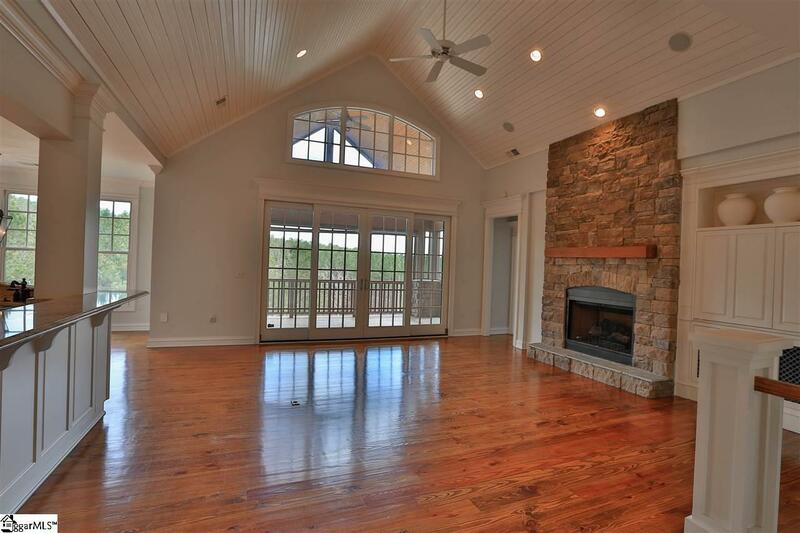 The white shiplap wainscot in the Dining Room and white washed wood plank vaulted ceiling in the Great Room combine with abundant natural light from the windows to greet you likes a breath of fresh air. The semi open plan flows seamlessly from dining to great room and into the kitchen. The bar counter in the kitchen keeps it separate but in view. It allows the fireplace ambience to be enjoyed from the kitchen. The large breakfast area at one end overlooks the yard and course view. 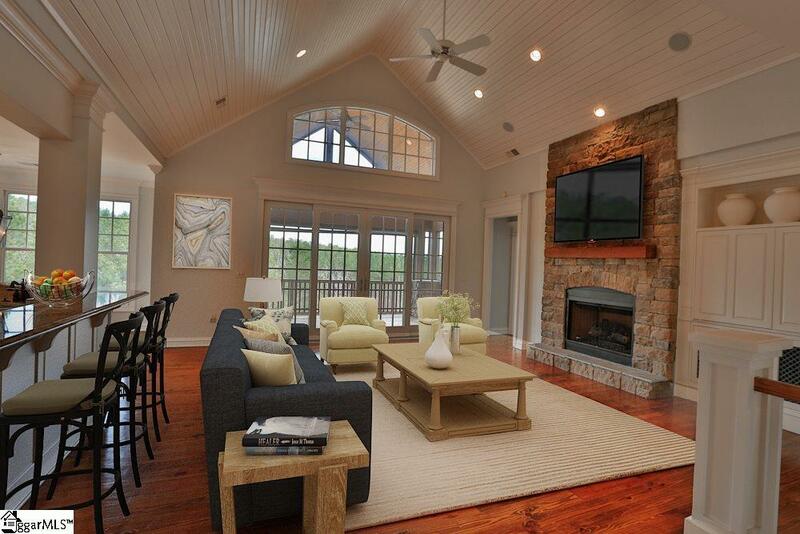 The master suite stretches along one end of the home overlooking views and enjoys access to the screened porch. His and her walk-in closets have built in storage to maximize space. His and her vanities and abundant use of tile in the bathroom highlight the attention to detail. The extent of tile in most bathrooms is impressive and at wainscot height in several, cleaning becomes breeze. A second ensuite bedroom on the main level, an often-sought-after feature, boasts a private deck. Also, on the main level is one of two laundry rooms, power room and garage access. Enjoy impressive outdoor space on both levels; vaulted wood ceiling on the main level screened porch and equally sizeable open porch below. The lower porch stairs access a huge flagstone patio with wrought iron fencing that creates a safe play area for kids and pets. With gates at each end, your entertainment options easily expand to the level yard that is perfect for your game/gathering of choice. If you have an interest in a swimming pool this yard can accommodate virtually any configuration you can design. The Terrace Level will delight family and friends lucky enough to be invited. As you descend the wide staircase, the Family Room with fireplace, sliding doors that open to the porch, refreshment bar and pool table area comes into view. A full kitchen, possible wine room or large pantry is tucked behind the family room for convenience without prominence. Guests will delight in this independent service option that does not intrude upon the hosts, at least for those who hope for a return invitation! A secondary laundry facility expands that appreciative guest possibility and practically assures being invited again. Three ensuite bedrooms plus a custom-built bunk room provide terrific accommodations for adults and children. Built in pieces in most bedrooms preclude the need for extensive furnishings. A multi-purpose room could be used as an exercise room or media room which would round out the superior space on this level. Be sure and watch the video tour that captures the essence of this homes amazing setting! All this just a short ride to The Reserve at Lake Keowees impressive amenities. Premier Membership is available. 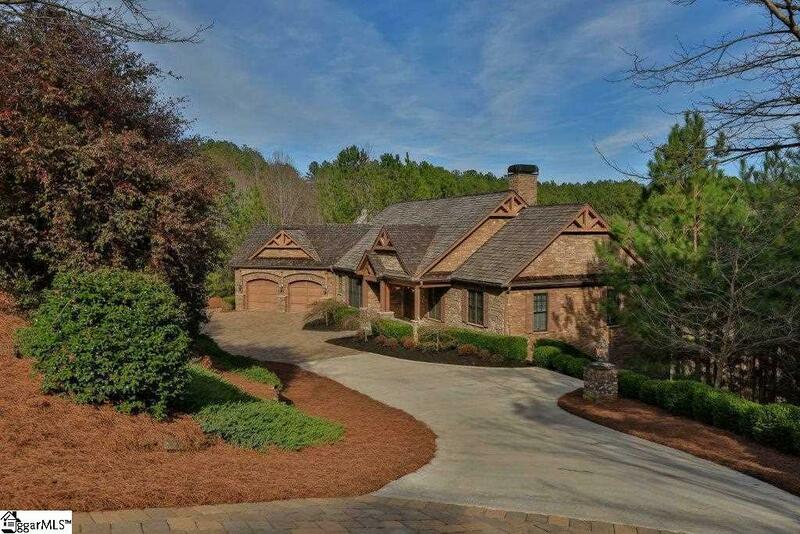 Listing provided courtesy of Libby Zorbas of Kw Luxury Lake Living.